Pedigree: Street Cry - Vertigineux by Kris S.
Note: Undefeated in 19 career starts so far. 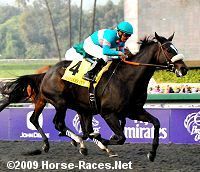 She won the Ladies Classic in 2008 and the Classic in her first start at 10f and against males in 2009. Was to be retired after that historic race but was instead returned to the track to win the Santa Margarita, Apple Blossom, Vanity, Clement Hirsch, and Lady's Secret all in Grade 1 company. She came up 6 inches short in her quest to become the second horse to repeat in the Breeders' Cup Classic, not quite getting up in time to catch Blame and finishing second. She has been retired to Lane's End Farm but no breeding plans have been announced as of mid-November. She was named 2010 Horse of the Year and Champion Older Female.